The first three GO-Stations are now operational in Canada’s high arctic at an undisclosed remote mine site. 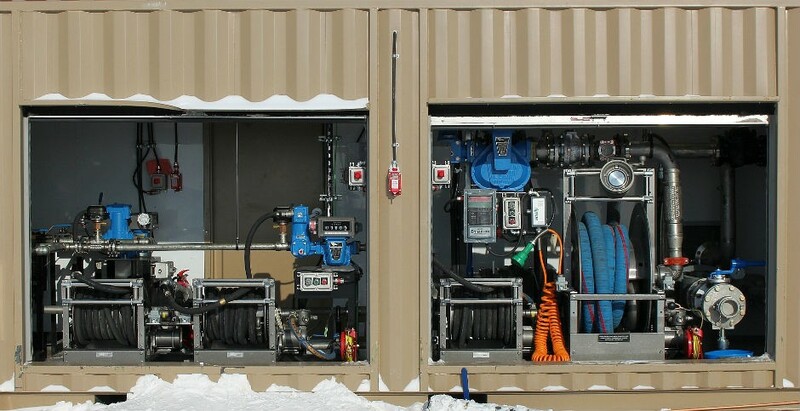 Built inside ISO containers, SEI GO-Stations are capable of providing everything needed to receive and transfer fuel from any bulk fuel storage system. Used to refuel vehicles and aircraft, GO-Stations provide a controlled, protected environment to house pumping, filtration, metering and dispensing equipment. Designed to withstand the challenges and wild weather of remote locations, the GO-Station is compatible with diesel fuel, jet fuel or lube oils (future models will also allow gas). All controls are explosion-proof and mounted within an onboard electrical room for easy access. Containers are insulated with doors and ports for connection to fuel lines and power. Stainless steel piping and valving is used to interconnect the modules. Fire suppression systems and spill protection is built-in. Multiple dispensing units are accessible by roll up doors with retractable hose reels to provide bulk transfer or refueling of vehicles, tanker trucks or lube trucks. All components are built on modular skids that can be easily moved for service or replaced, if the need arises. Explosion-proof lighting is standard and area explosion-proof heating is available as an option as are automated tank monitoring and fluid controls.